If you are following open source community from last 4-5 years, you’re probably well familiar with the Freeduino Microcontroller Movement. This simple microcontroller is wonderful piece of engineering with bringing physical computing to the mainstream. You can build almost anything like Robots, 3D Printers, CNCs, data-loggers, LED Blinking, Clocks, and so on…Freeduino is an open-source microcontroller building platform that is based off of Ardunio® hardware. Freeduino have freedom with trade mark and copyright. The Duino system, which is used to describe Freeduino, Ardunio®, and all derivative systems, is used to create a single-board microcontrollers. A single-board microcontroller is a small computer system made on one board. All the essential components of the computer are loaded onto the single board, making it very small and weaker than full systems but space efficient. The original creator of this system was the Ardunio® company. When they made this system, they specified that it was open-source, but only under certain conditions and parameters. The lack of clarity about just how open-source the system meant many creators were worried about making their own system. To solve the open-source issue, Freeduino was created. This system is similar to Ardunio®, and is used colloquially to mean any system that is Ardunio® compatible, but does not use the official name. 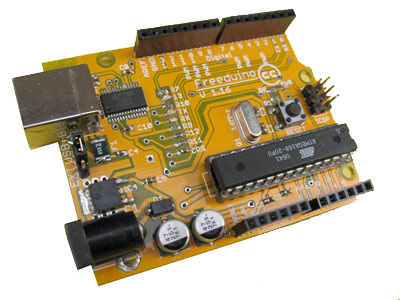 Unlike the open-source confusion, Freeduino is completely open-source. In terms of power, parts that can be used, and the software used to change the microcontroller functions, both Duino systems are practically the same.